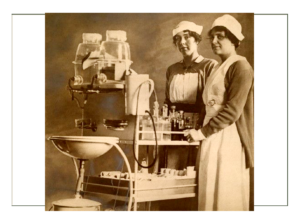 Inventions changed lives. 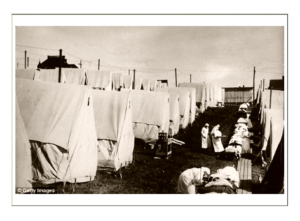 Life was more sanitary and safe. 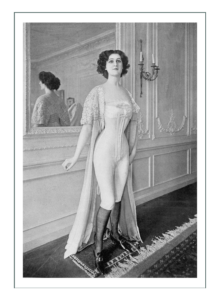 Reform clothing was finally accepted as some actually gave up corsets. 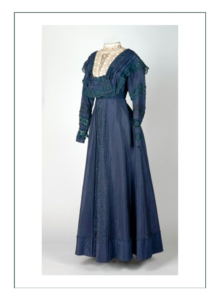 Women had a role in science and invention, so garments and textiles were more comfortable and practical overall. 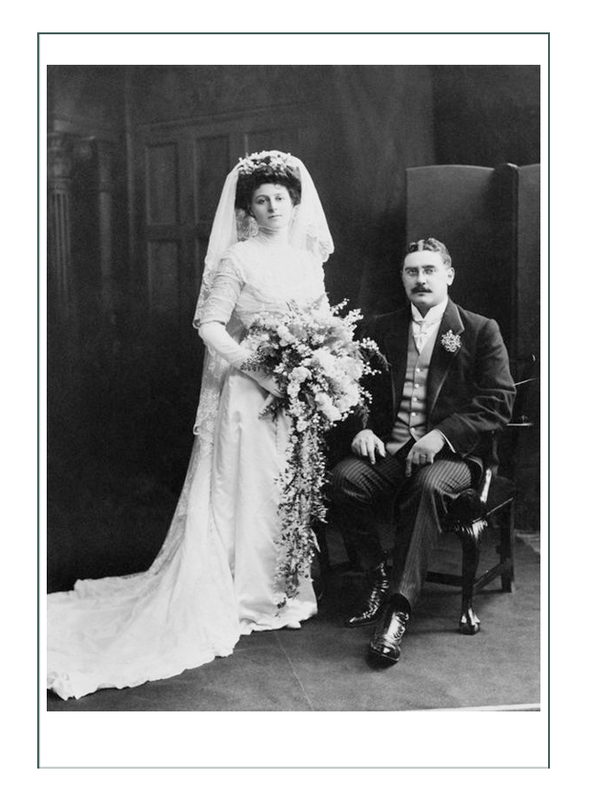 All of the features of weddings and funerals as we know them now: white veils, necklines, white gowns, came together at this time. 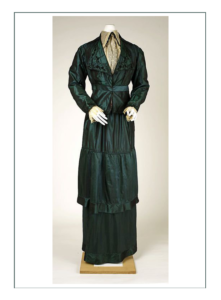 The desire to be fashionably dressed increased. 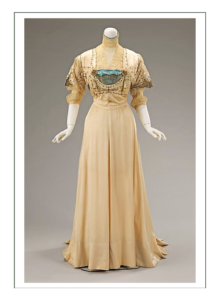 Women’s clothing was designed to make a statement and those who could afford it had exclusive tailors. 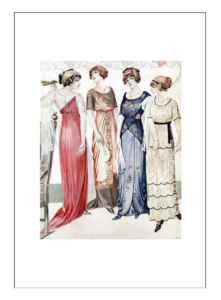 Middle class women emulated the upper classes in buying readymade copies of high fashion. 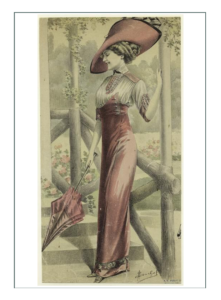 Sunday was a day to dress up and parade fashion. 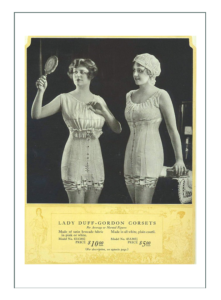 The concept of ready made to fit was introduced by department stores. 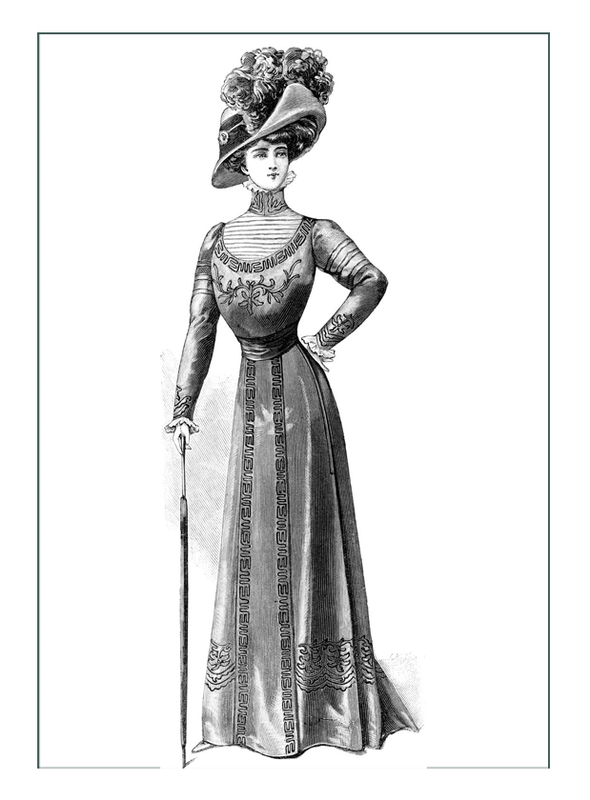 A woman would select a mass produced garment off the rack, and an in store tailor would fit it to her. 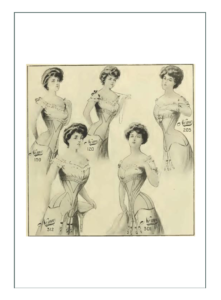 American concepts of efficiency and function, combined with a more relaxed pace became the new ideal worldwide, usurping nobility and strict rules of Edwardian and Victorian societies and fashion rules. 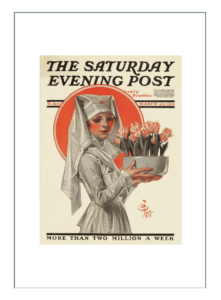 American wealth bought influence, and the youthful American spirit pervaded science and technology. 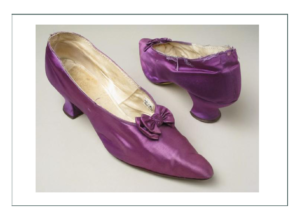 Americans had the hook and eye before anyone else, and the invention of the zipper for camping gear led to BF Goodrich’s invention of rubber galoshes, although it would be France who would put the zipper in men’s pants. 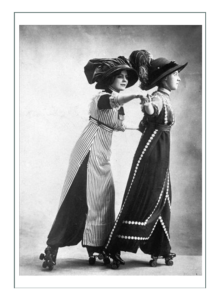 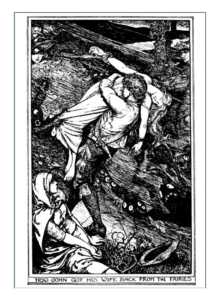 Moving pictures allowed people to see how others moved and how fabric behaved, which influenced behavior and the definition of what was “fashionable”. 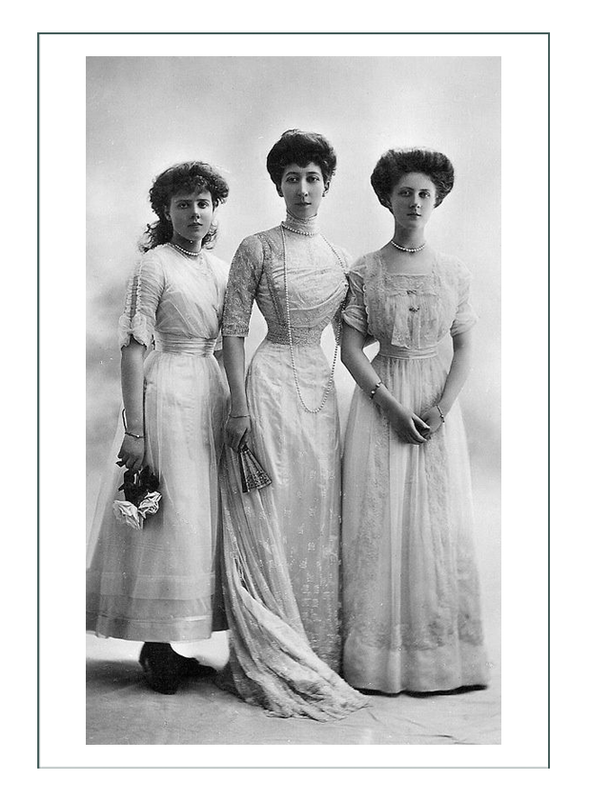 The desire to be fashionably dressed by all women increased when they could see their idols like English Royals Princesses Alexandra and May wearing the new “Princess” waistline. 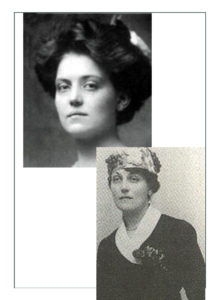 Alexandra and May of England were fast friends with the American president and his daughter at the time. 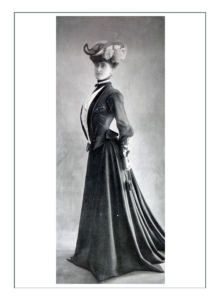 Along with her philandering husband of Lillie Langtry liason fame, they traveled often to the eastern United States, where they were feted and treated as the royalty they were. 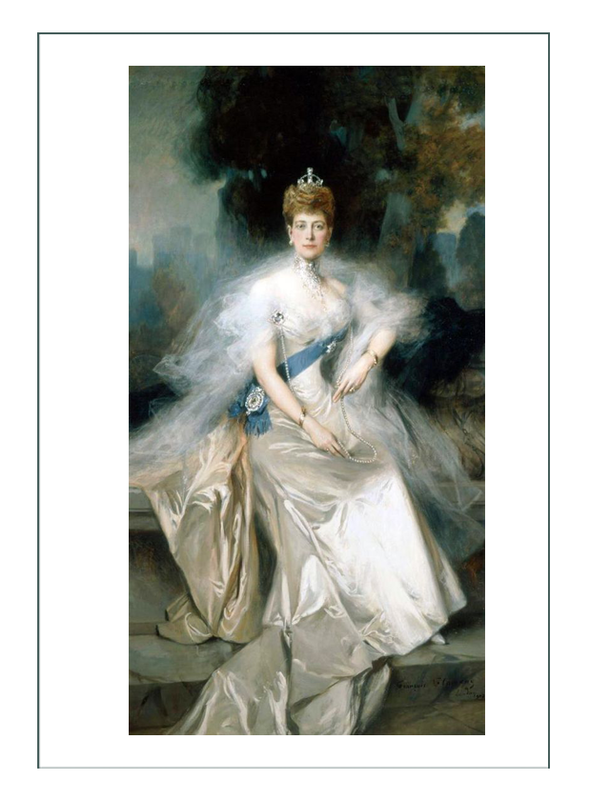 Alexandra had influenced fashion from the beginning of her marriage in 1863 to Edward Prince of Wales, and Princess May of Teck was Alexandra’s son Georges wife (married in 1893). 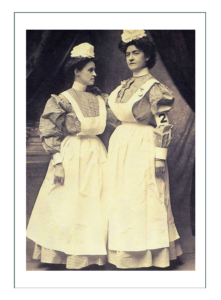 These two women epitomized the Edwardian period, as the Victorian Era ended when Queen Victoria died in 1901. 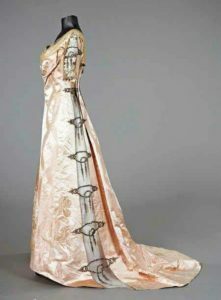 The pouched bodices, curving belts, flounced skirts, and jewlery now reflected the Art Nouveau fluid curves. 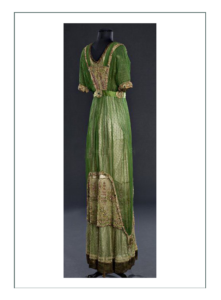 Fashionable clothes were extravagant and expensive, with copious use of embroidery, lace, and fur. 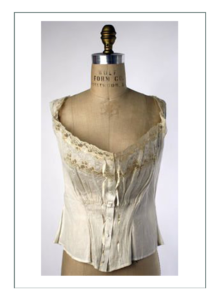 The bodice was flat at the back and pouched at the front. 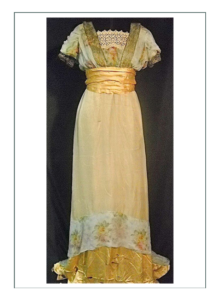 The center front appeard to be lower than the waist, and effect emphasizzed when the top of the belt at the cneter front was on the waist with the bodice falling over it, and the bottom of the belt was on the waist at the side. 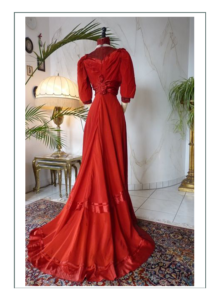 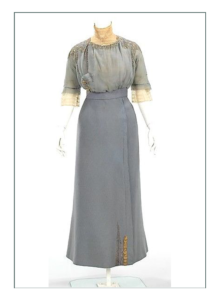 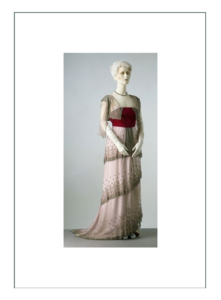 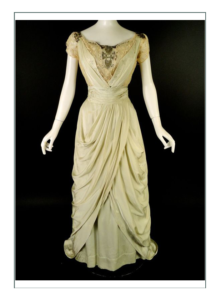 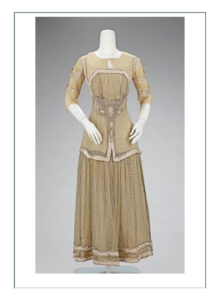 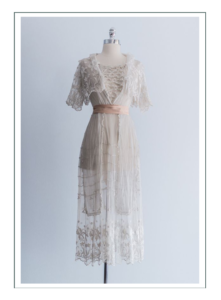 Under the direction of Edwardian “La Belle Epoque” Parisian designers – notably Worth (of Empress Eugenie of France fame) and Poiret, the princess introduced a new silhouette with a different waistline, shape, and form. 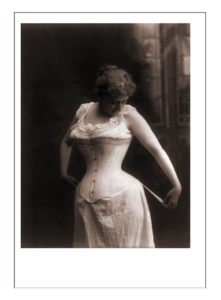 While it still demanded rigid corsetry, American women embraced the new shape as their own. 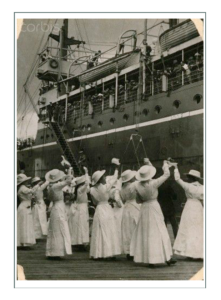 The rest of the world then followed the American women. 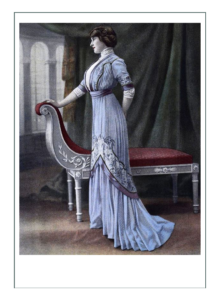 1909-1910 were transitional years between the 5 different factions of the Edwardians, and what was arising in the 1912 “Titanic” era and forward into WWI. 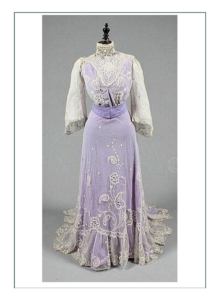 The transition from the Edwardian high fashion into the longer lines that would embrace 1910 and forward, was not simple nor a single day. 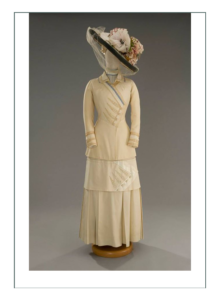 Women moved gradually from the shapes of the past few years, changing gores, skirts, and undergarments every season. 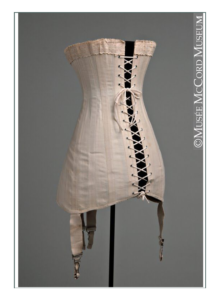 Some hung on to their old corsets and skirts, while others grabbed the latest thing. 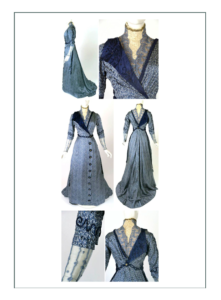 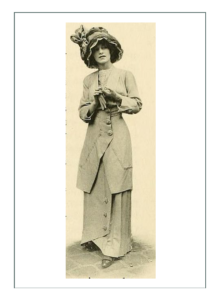 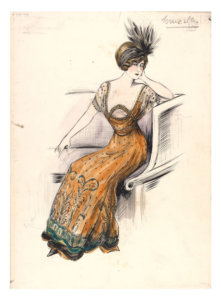 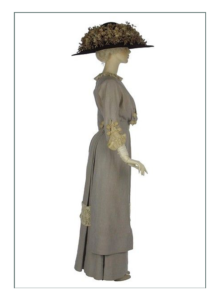 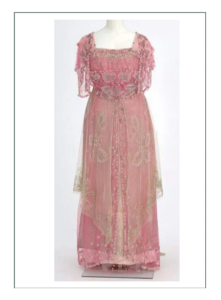 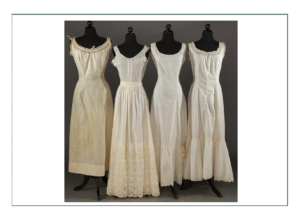 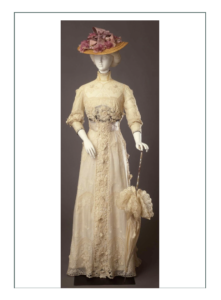 This is why this time era is so difficult to interpret, and it is necessary to define character and function, because almost “anything goes” could have been the motto of fashion heading into 1910. 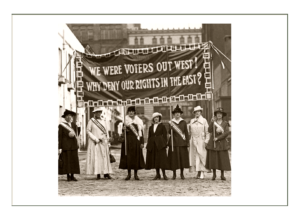 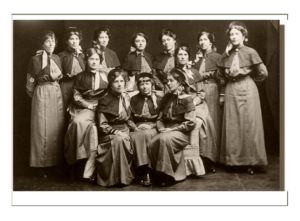 Women were now active members of society. 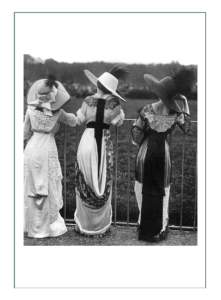 Those of all classes worked outside the home and participated in leisure pursuits and sports, although these were still gender specific. 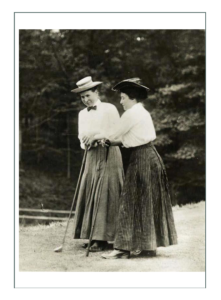 The first modern Olympics allowed men to compete against women, and resulted in change in roles and fashion for men and women. 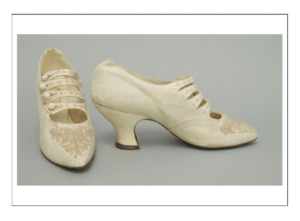 Sears and Roebuck catalog sold the first pair of sneakers with rubber soles for $.60/pair. 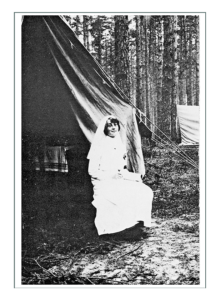 America had the hook and eye long before Europe, and the invention of the zipper for camping gear led to BF Goodrich’s rubber galoshes and eventually zippered hiking boots. 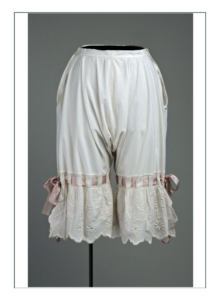 France put zippers in mens’ pants saying they were good to “avoid the possibility of unintentional and embarrassing disarray”. 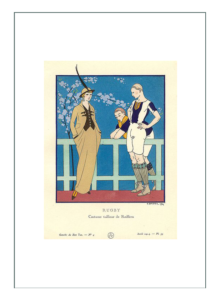 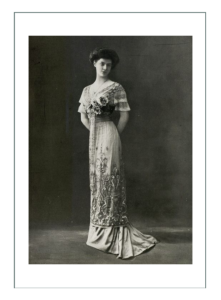 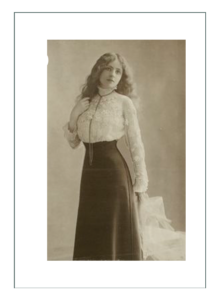 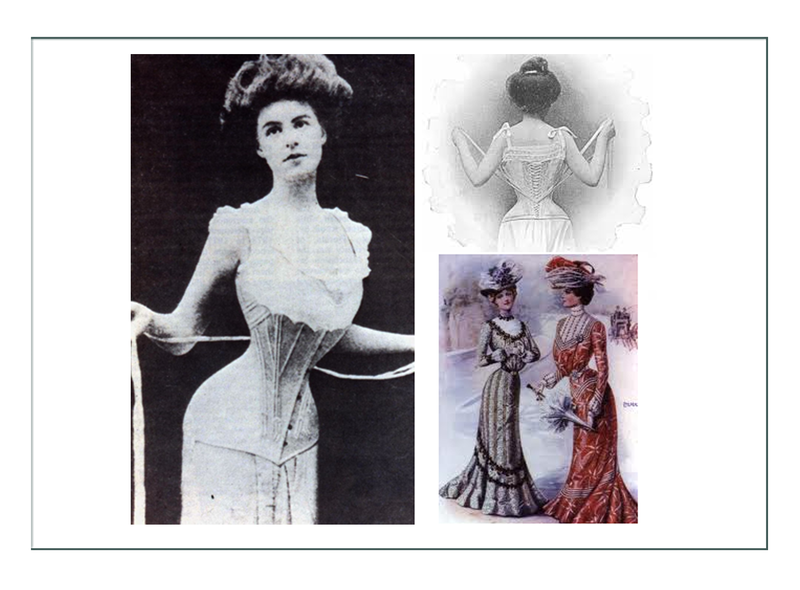 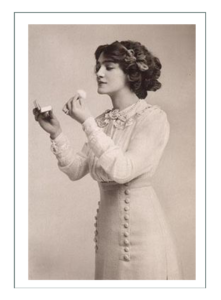 The corset was still the center of the fashion universe as it directed the shape of the silhouette, although there were MANY types and choices from flexible sports to the rigid “S monobosum” of the Edwardians and boudoir silks for stage performers. 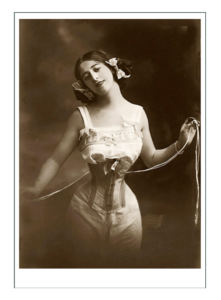 The busk was straight and the waist tightly laced with the goal to have no cleavage and to suppress the bosom. 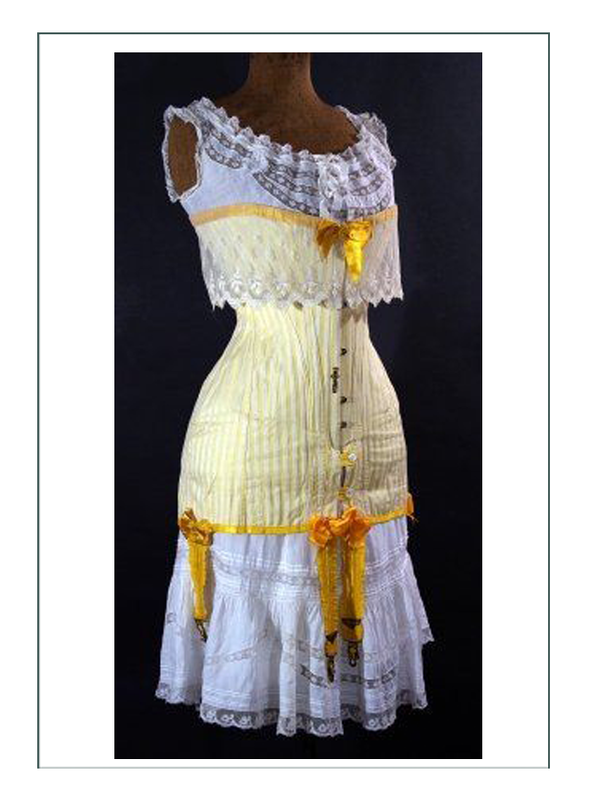 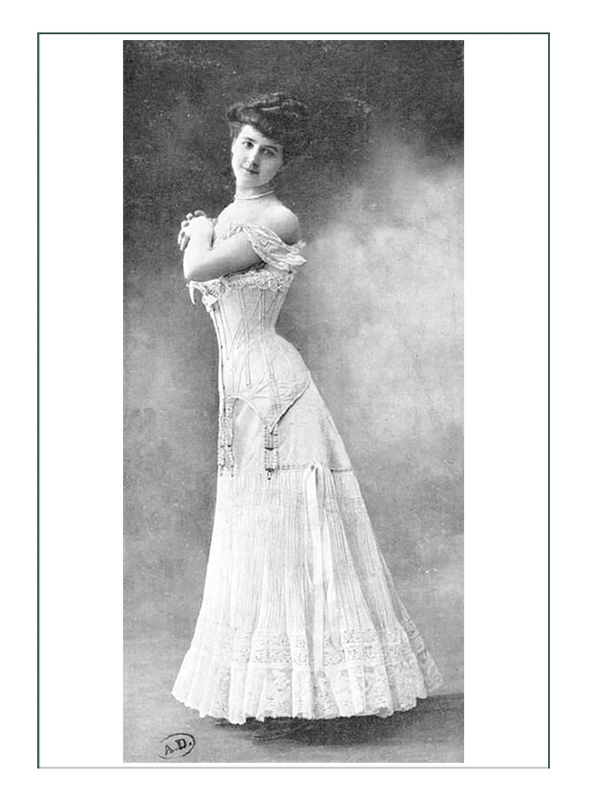 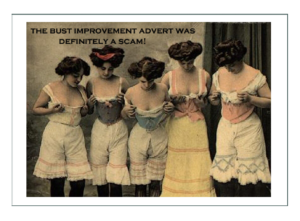 The “under the bust” era had begun, a short topped, but long bottomed corset to accommodate the new more columnar style which was introduced by Parisian designers after 1907. 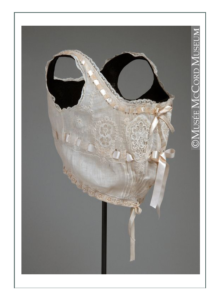 The “bust supporter” or “bust bodice” (later called a brassiere by the French) was a version of the old chemise/corset cover with some structure added. 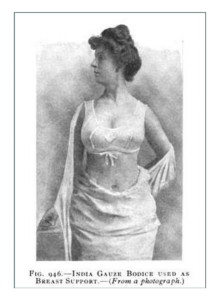 Which meant the rest of the undergarments had to evolve too. 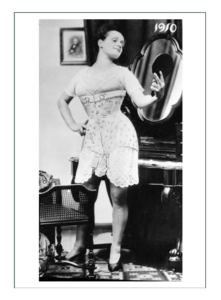 Petticoats no longer created the shape of the skirt, and they were not functional in insulation or protection, but were more as a sweat and comfort barrier under the corset. 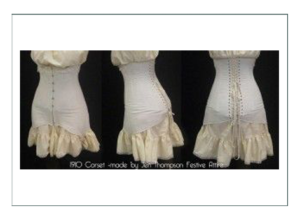 Some were long like the period silhouette, but many were short so they could be gathered up by the new stocking GARTERS which hung from the corset. 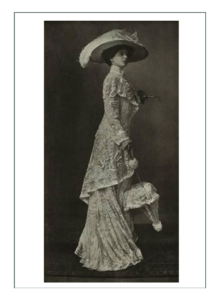 A major change, especially in uniforming, is that women no longer wore multiple petticoats, if they wore one at all. 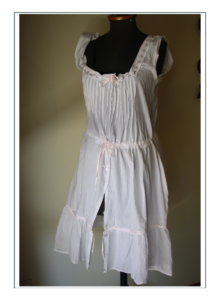 The “slip”, more like a “fluffy bottomed chemise” made working much easier. 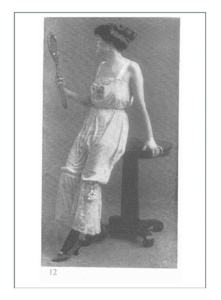 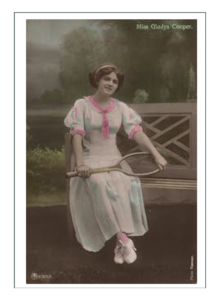 In sports women wore knickers made of chamois. 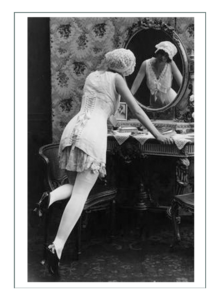 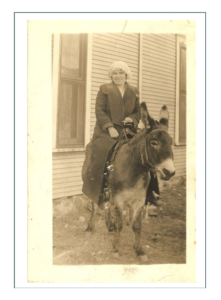 Drawers and knickers were still split so women could use the now commonplace indoor plumbing. 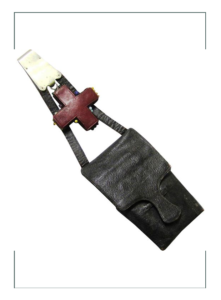 Belts were straight or had a slight “V”, the difference now being it was functional and made of synthetics. 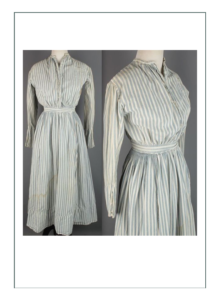 The combination was still in favor, and both had some inset lace and edging, but most were of a good durable cotton fabric, perhaps with a woven stripe for interest, and with simple finishes. 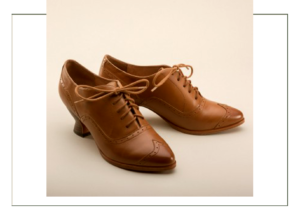 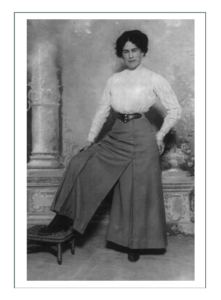 Many for working women had a pleated or ruffled bottom for ease in quick rotational movement necessary for her job. 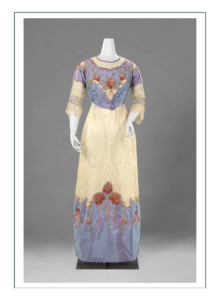 Fabrics were pale in 1910: steel blue, lemon yellow, and cream were favorites alongside oriental concepts which brought in contrasting black, red, royal blue, and emerald. 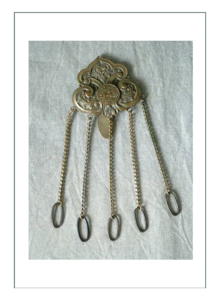 Greek and Byzantine nostalgia returned from the early 1800’s, but this time women were equipped with curling irons to get the ancient look. 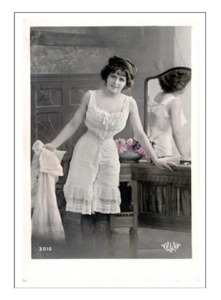 Blow dryers of the era weighed 20 pounds. 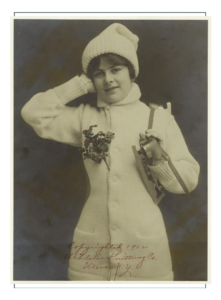 Women wore gloves EVERYWHERE. 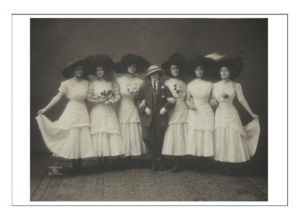 Hair was long and high in frothing waves, and hats got smaller and worn “jauntily atop”. 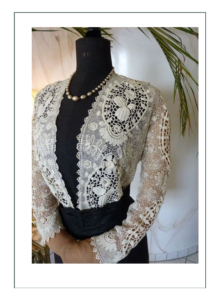 Normal women now got out of the house to pursue leisurely or work pursuits wearing clothing that could keep up with them. 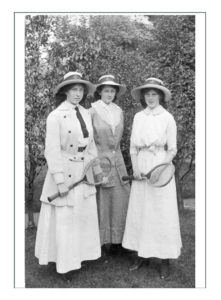 Swimming the English channel or sipping tea – it led to branded designer ready made and branded sportswear. 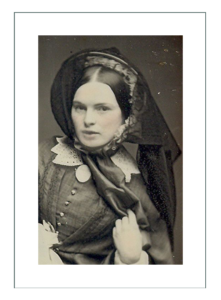 Women did not need a purse because they charged everything at the store and so did not need cash. 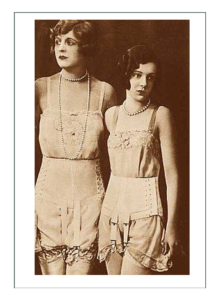 They used minimal make up at this time, and only had tiny bags that hung from the wrist for calling cards or keys. 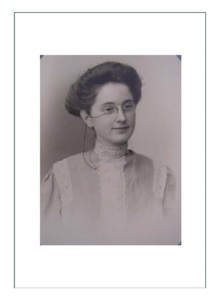 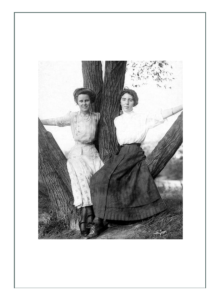 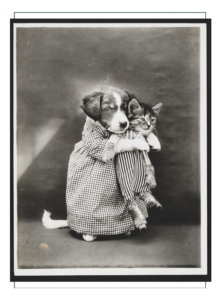 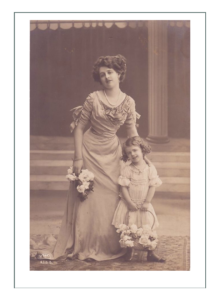 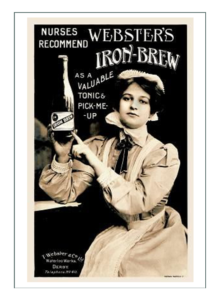 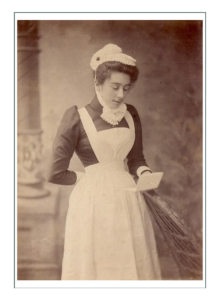 By the 1900’s more women were working as governesses, shop assistants, and typists than ever before. 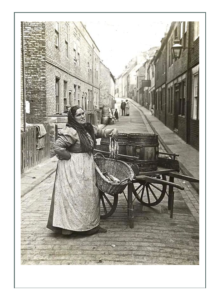 The clothing industry was the 2nd largest employer with 300,000 women in Britain alone, next to domestic servants. 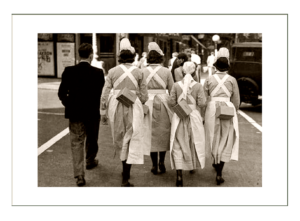 Uniforms evolved over time. 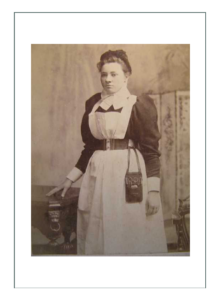 Early healers did not wear anything to set them apart. 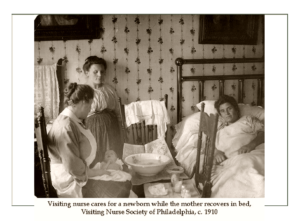 In the Middle Ages when religious orders were involved in the caring of the sick, the nun’s habit became assoicated with nursing work. 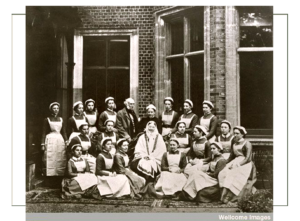 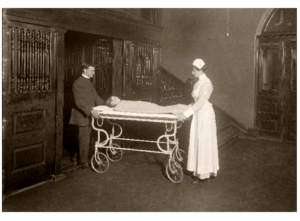 As nursing turned into organized disciplines in the 19th century, the flowing robes of the nun persisted worldwide. 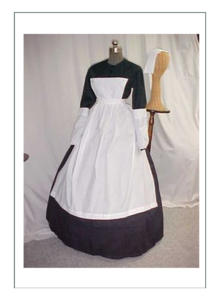 This would influence the design of uniforms for hundreds of years. 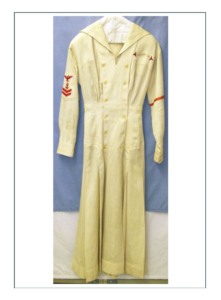 Uniforms were designed to identify the person with a specific institution of learning, teaching, or nursing practice. 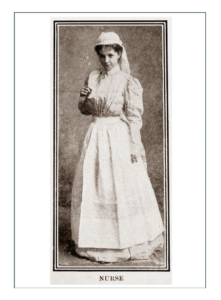 Pride in belonging to a prestigious hospital had some uniforms with flamboyant designs such as huge sleeves or giant skirts, although all along the silhouette typically aligned with that of fashion of the day. 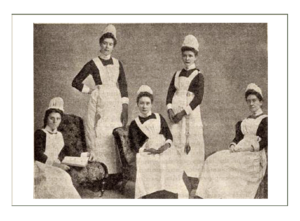 They more closely resembled whatever domestic servants were wearing at a given time, which was usually a version of high fashion. 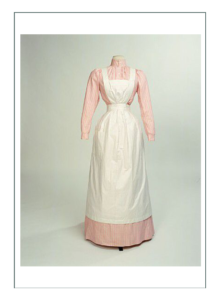 Color and style were used symbolically – white for hygiene and cleansiness, blue for purity, and pink for femininity. 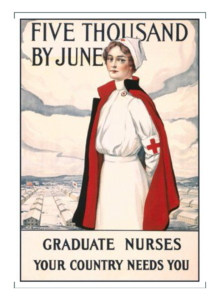 One of the most striking and memorable use of color and symbol in the late 19th and early 20th centuries was the Red Cross’ with its emblazoned red cross. 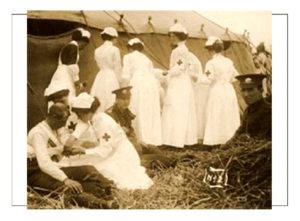 It designated humanitarian aid to battle wounded on either side of a conflict. 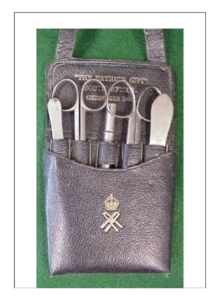 A combination of practical, political, and symbolic, bands, stripes, and colors were used to differentiate between ranks. 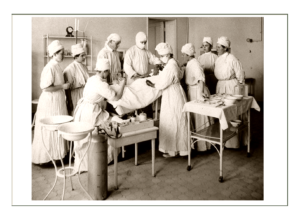 By the end of the 20th century, those bonds were broken in the invention and use of “scrubs”, which were practical and unisex. 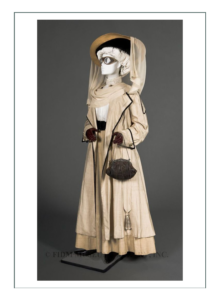 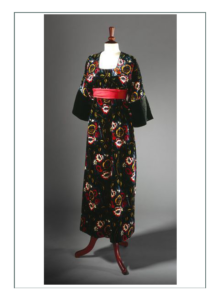 When Florence Nightengale, the founder of the profession of nursing as we know it today asked Redfern to design a uniform for her corps in the Crimean War, the company met her deadline and specifics to create the “look” we know today. 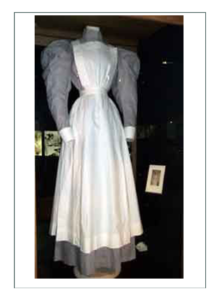 Unfortunately, Redfern forgot to ask for measurements, so none of the uniforms fit. 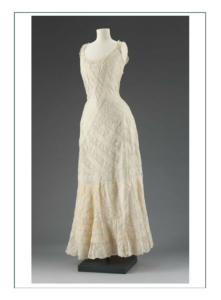 Women’s clothing became more tailored and designed to make a statement as the concept of ready made meant taking a garment off the rack of a department store, and having it fit to you. 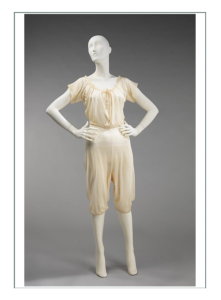 American high fashion design company Redfern had invented the “yachting suit”, which was the first branded sportwear. 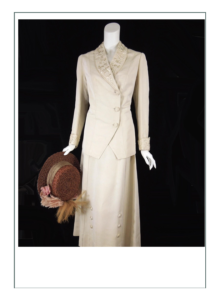 Women wore 3 piece “suits” in the workplace so they could feel powerful as they blended in with the men. 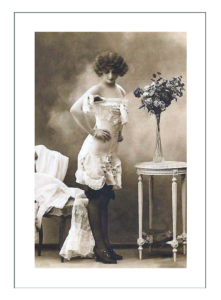 It’s no wonder men found them “unladylike”. 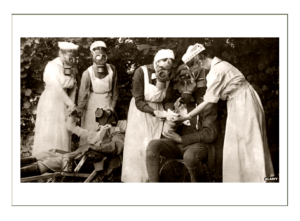 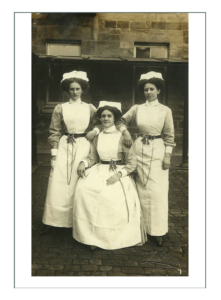 Uniforming reflected fashion and the class or status of a nurse. 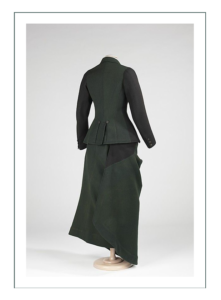 You can see in 1910 uniform silhouettes the remnants of the old “monobosum” with its padded rump and bosom, but now it has a lower waist and a longer and straighter line. 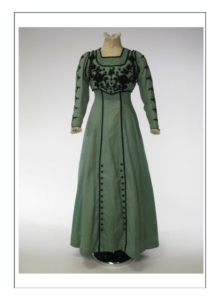 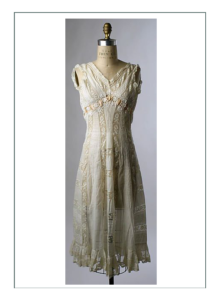 Fashionable blousewaists were typically of simple printed cotton, and somewhat tailored. 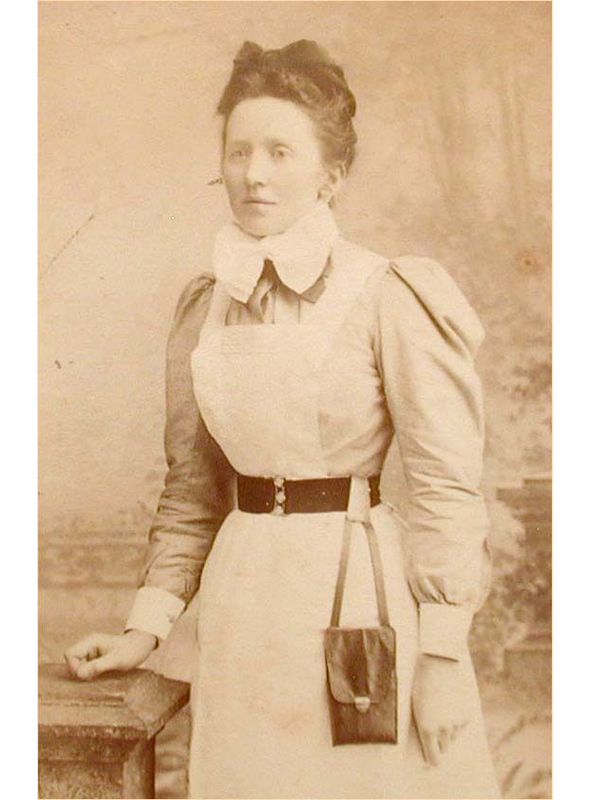 Early ones had removeable collars and cuffs with celluloid standing tabs, but as ready made and washing machines progressed, collar and cuff became integrated with the blouse. 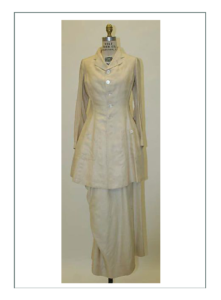 Split drawers are very basic and strictly functional sanitary white cotton, worn just for modesty under uniforms. 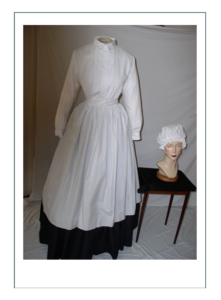 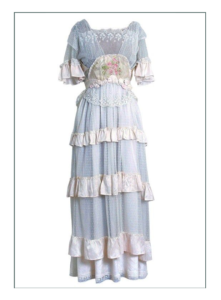 The uniform of 1910 was based on domestic servant uniforms. 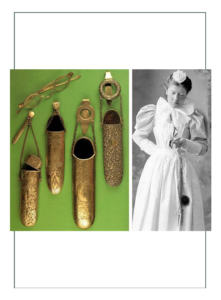 Being fashionable was low priority behind function, function, function – and symbolism and status. 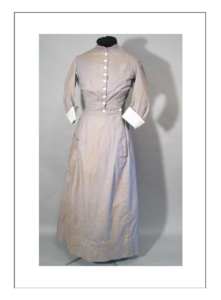 At this time there were now pockets at the breast, button down or standing “stock” collars which were stiffer than anything else at the time. 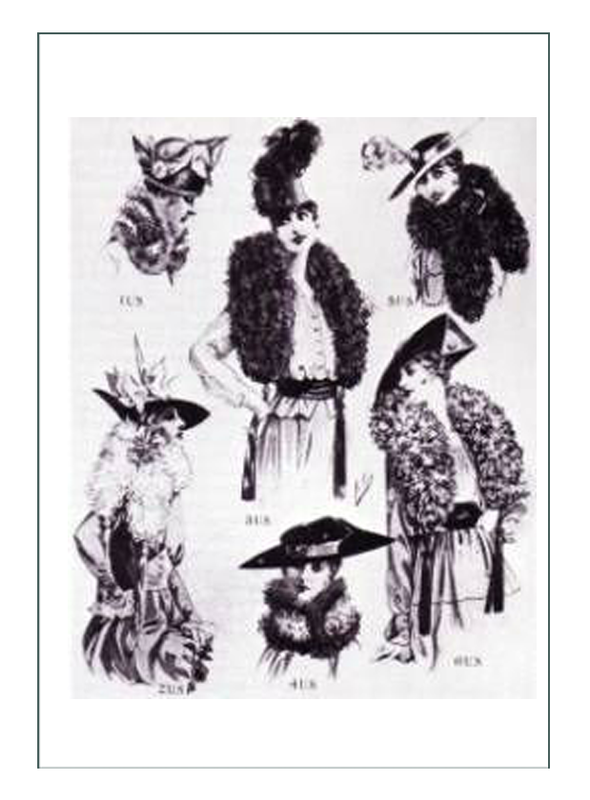 Collars could also be pointed. 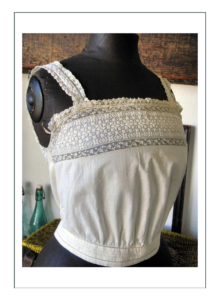 Bibs went to the waist and were folded and gathered into the apron skirt. 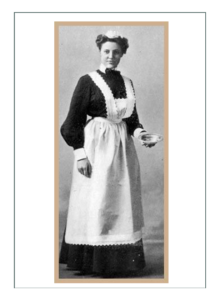 Aprons sometimes did not cover the whole dress, and were not fitted to the dress skirt. 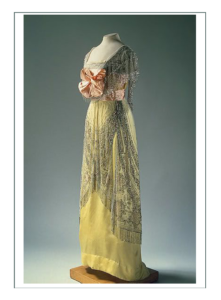 Gowns were “blousewaists”, and were of one same color, one pieced, and often had a small print. 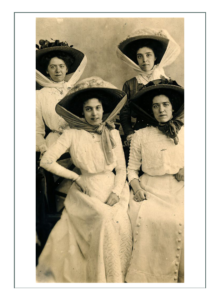 Large hats were starched and many had veils like nuns. 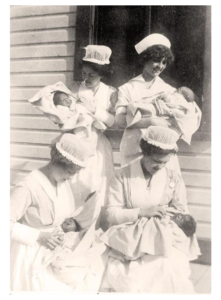 They were cloth like mobcaps in the beginning, and later were made of paper. 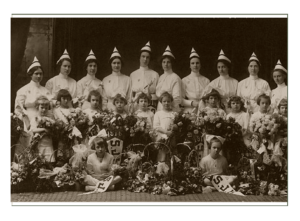 Status bands on the caps were pink or pastel blue for “newbies”, nd seniors wore black ribbons. 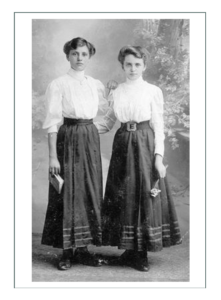 Sleeves were rolled. 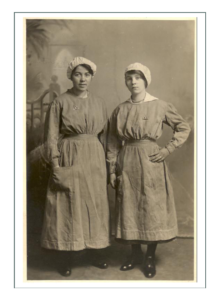 The function of the nurses apron is clear in protecting the clothing and being easy to put through stringent and oft times washings. 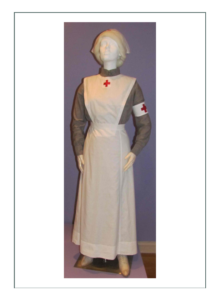 It’s stiff starchiness indicated nursing status and symbolized “purity”. 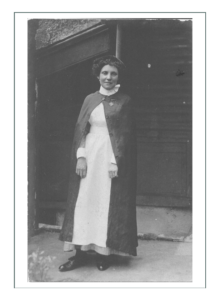 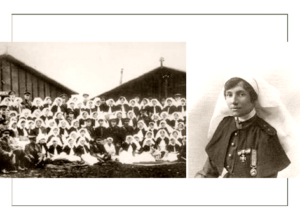 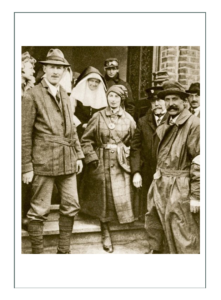 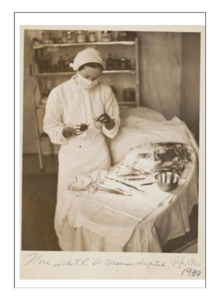 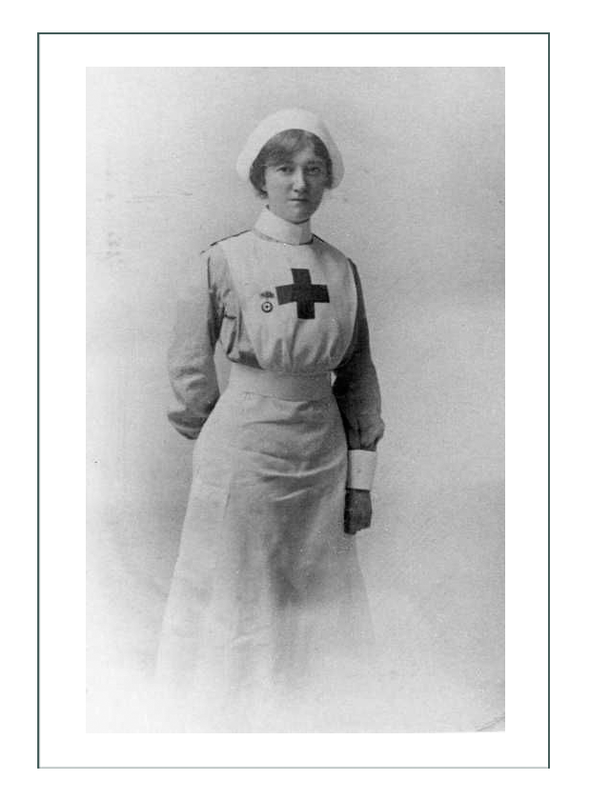 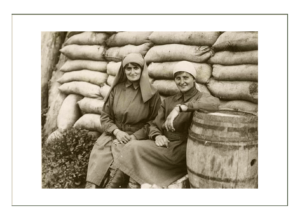 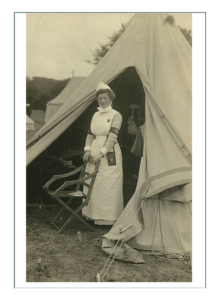 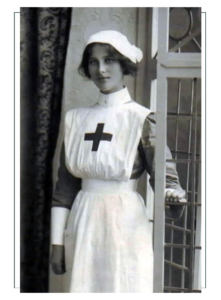 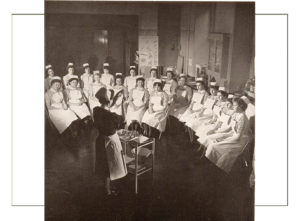 As with the Red Cross, a volunteer organization which required women to make their own uniforms, design and details of aprons varied by individual and hospital. 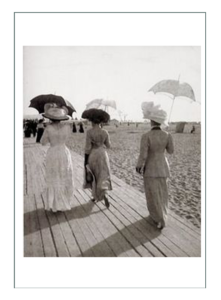 There are no patterns and no designs; only photographs. 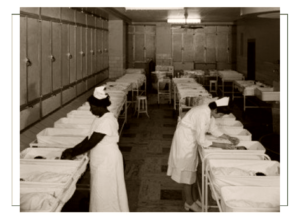 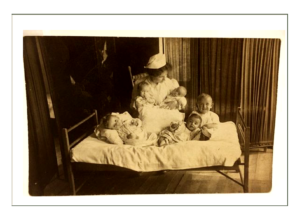 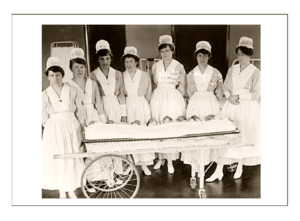 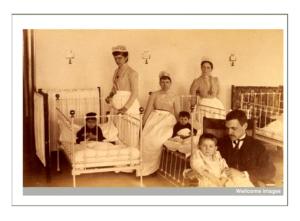 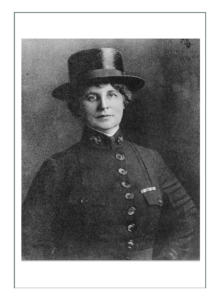 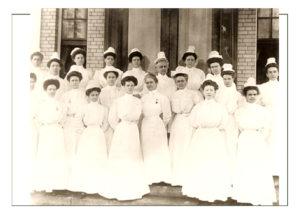 Caps in particular reflected the evolution of nursing. 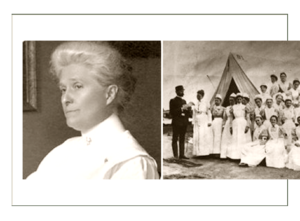 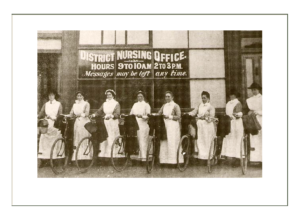 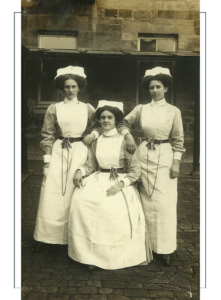 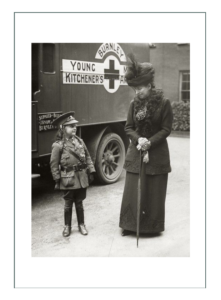 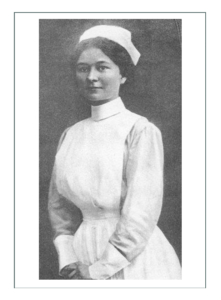 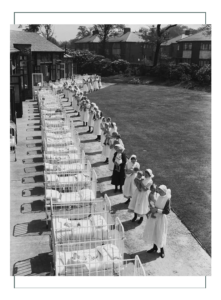 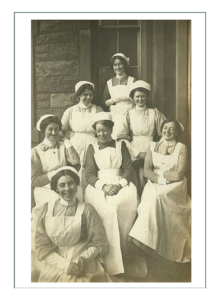 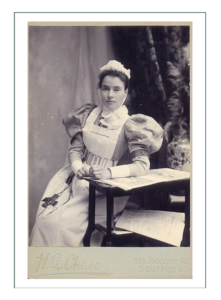 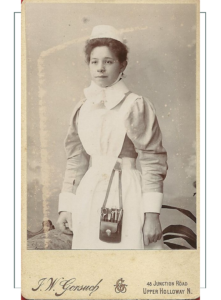 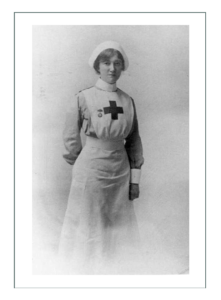 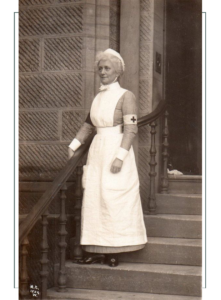 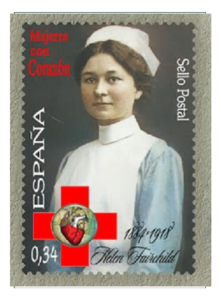 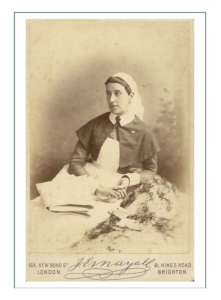 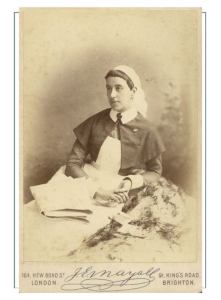 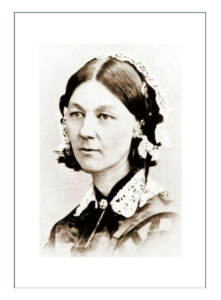 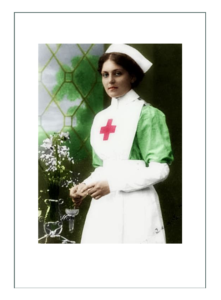 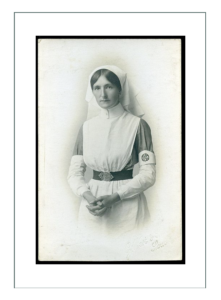 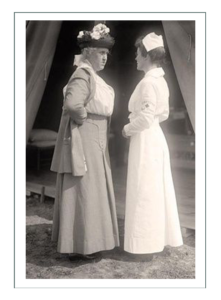 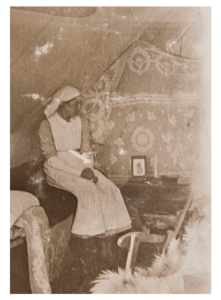 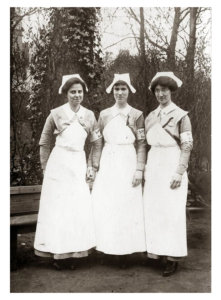 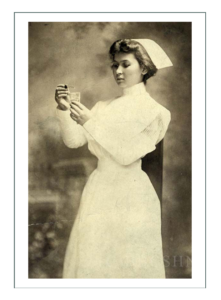 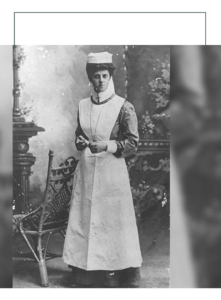 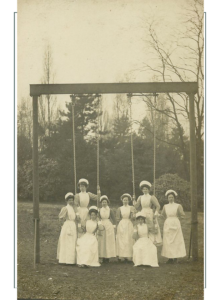 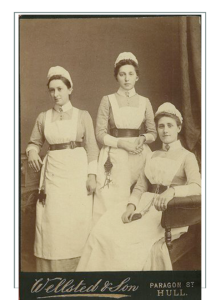 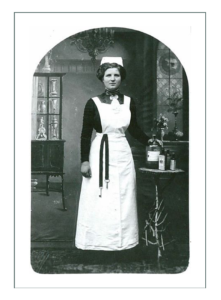 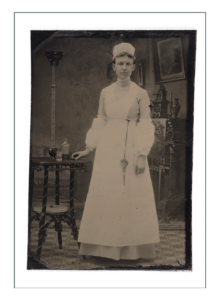 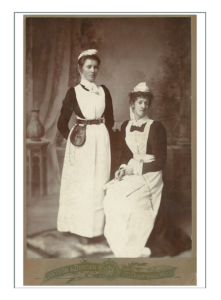 They show how nurses were perceived, and what their roles were at different times. 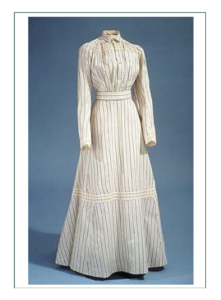 Early versions were like a nun’s coif made from starched white material. 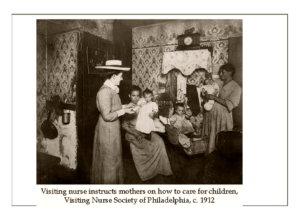 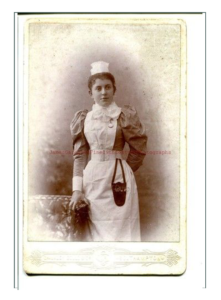 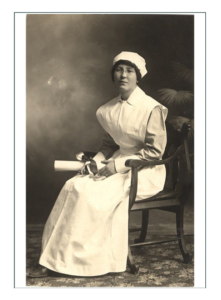 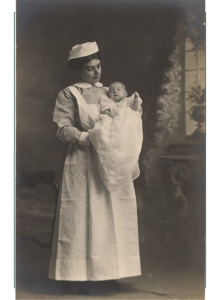 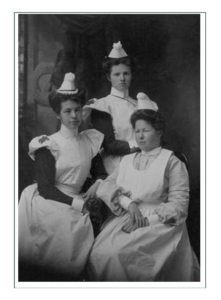 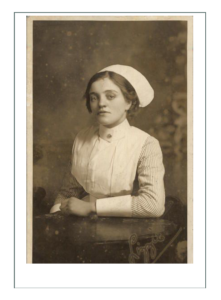 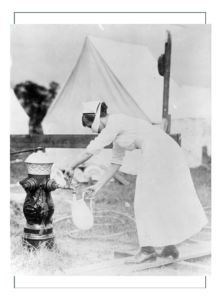 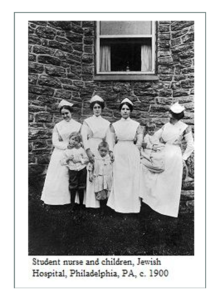 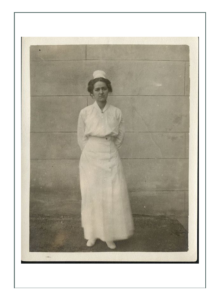 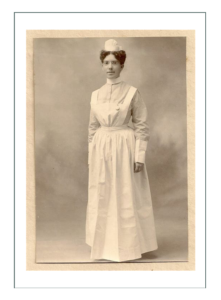 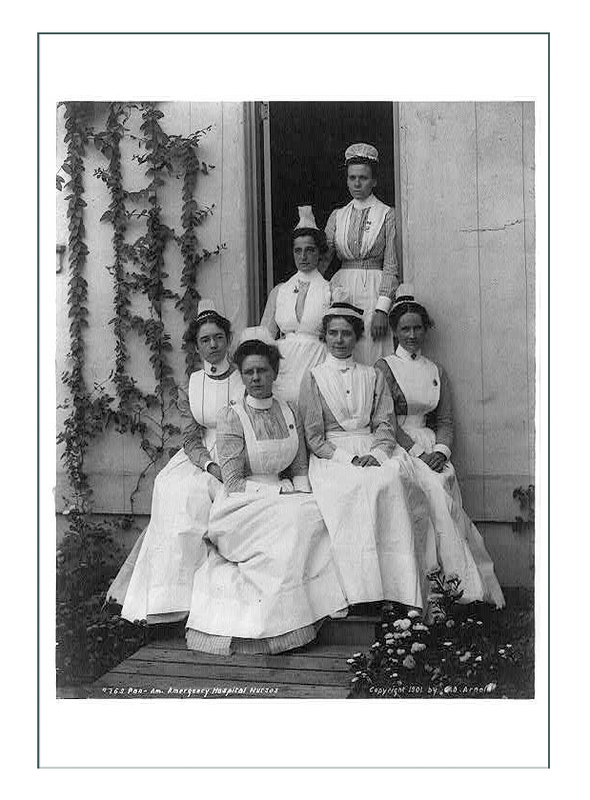 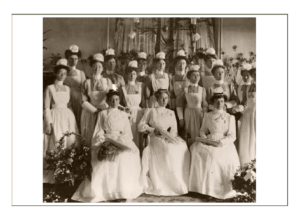 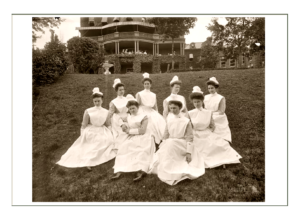 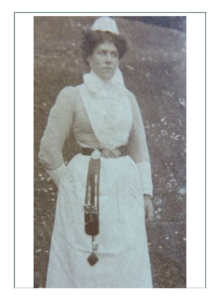 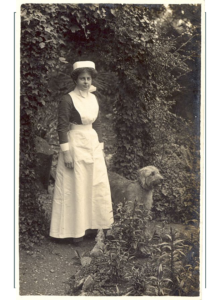 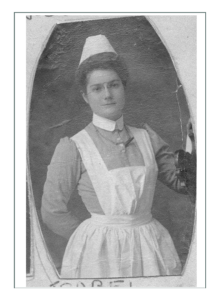 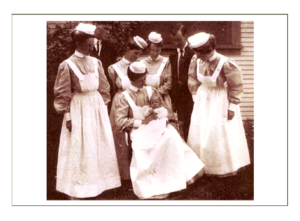 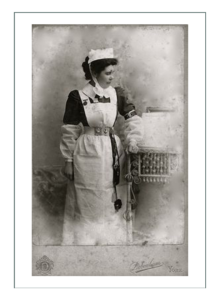 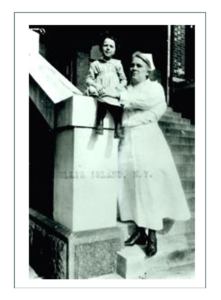 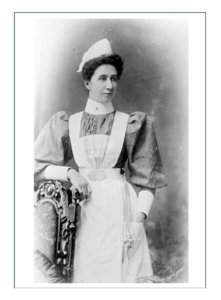 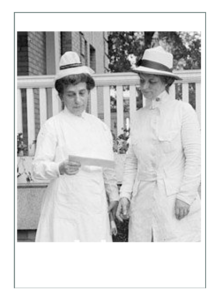 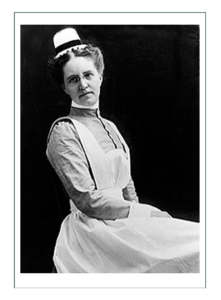 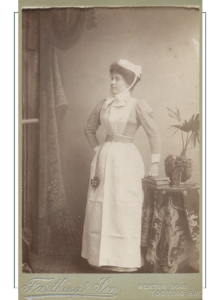 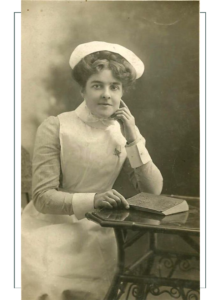 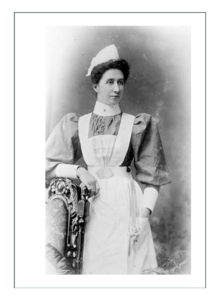 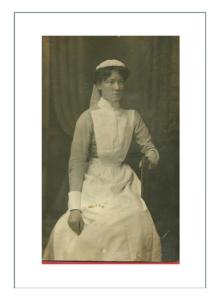 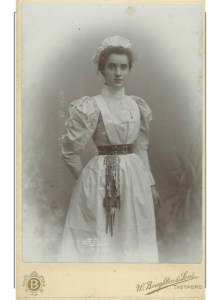 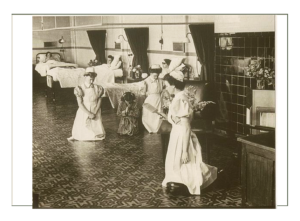 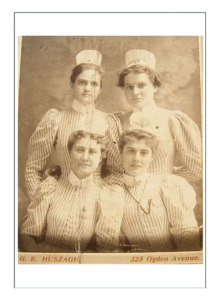 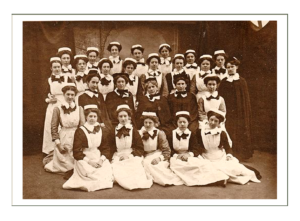 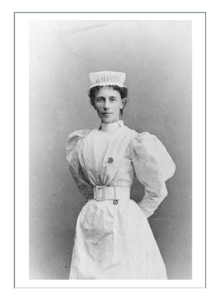 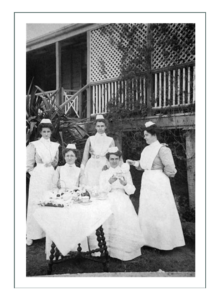 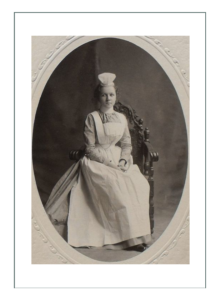 In the USA by 1900, nurses wore a mob or maid’s style cap that was influenced by domestic servants’. 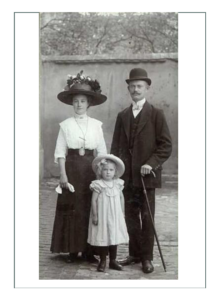 Caps became sharper and less flowing as time went on. 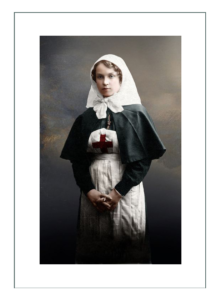 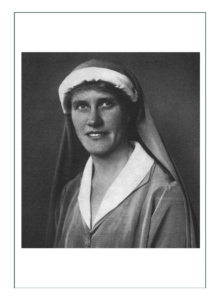 They held symbolic value, especially in the field of war when they retained a nun like veils to denote their purity and to set them apart from the chaos of war. 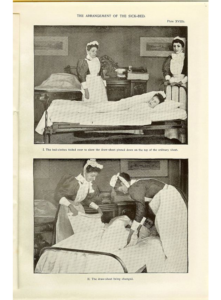 but as germ theory emerged, were also a practical part for cleansiness and to hold all the hair back from the face. 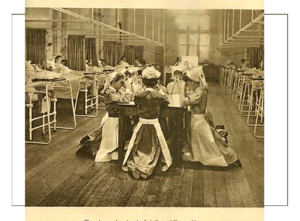 Unique and sometimes intricate styles were dsigned by individual schools or hospitals to give a clear identity. 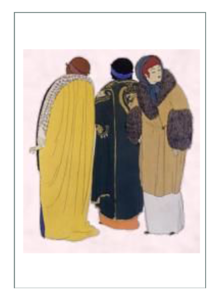 Colors or stripes were used to indicate grade, status, or seniority. 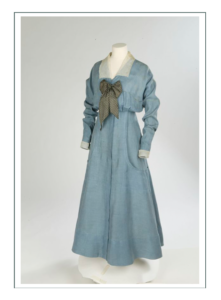 As women became more involved in science and research, they gained more input into the design and use of machines and devices; making clothing and textiles more sanitary and comfortable. 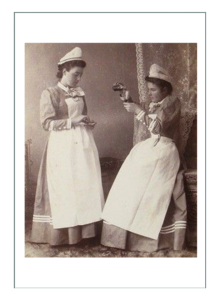 The physician led “reform” clothing which included bloomers and Aesthetic dresses without corsets were finally socially acceptable. 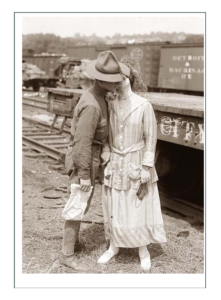 Since everything was charged and since make up was minimal at this time, women didn’t carry cash and didn’t need a purse. 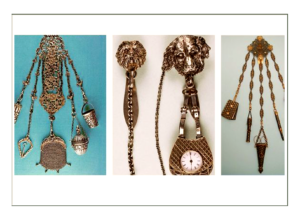 A chatelaine was a “carrier” attached by a pin or to a belt. 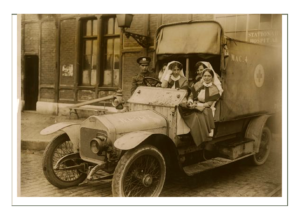 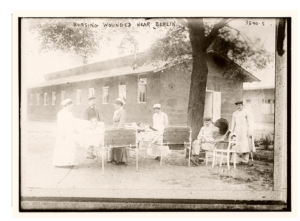 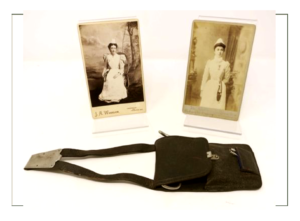 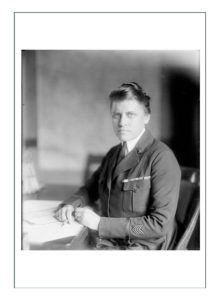 Prison wardens carried keys on theirs; women sewing supplies, and nurses had a kit pack with tools of the trade. 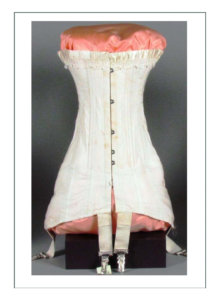 Synthetic materials were significant – elastic belts, crepe de chine, and the vulcanite rubber originally developed for tires used for false teeth and jewelry. 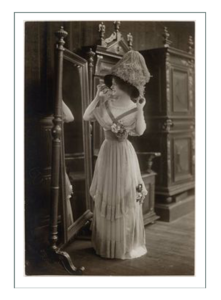 Celluloid, invented for billiard balls, was used for collars, cuffs, buckles, and combs. 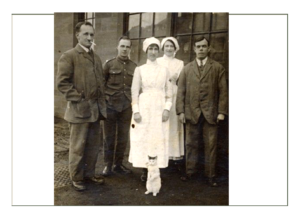 Or did we mean – the CAT? 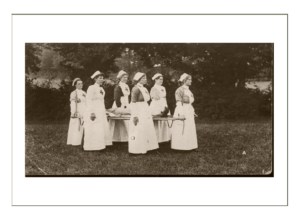 Very few photos exist showing the BACK of the apron, and there is virtually no written commentary. 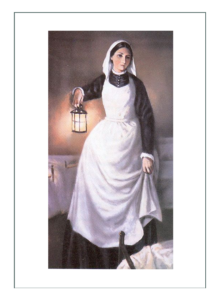 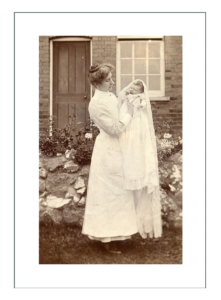 Because many nurses were required to provide their own, it seems a simple, white, starched type emerged from the nun’s habit, and was only slightly modified over time and place until modern day scrubs appeared.